Philosophy is the journal of the Royal Institute of Philosophy, which was founded in 1925 to build bridges between specialist philosophers and a wider educated public. 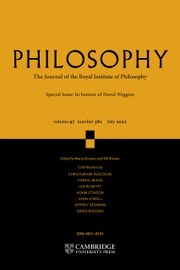 The journal continues to fulfil a dual role: it is one of the leading academic journals of philosophy, but it also serves the philosophical interests of specialists in other fields (law, language, literature and the arts, medicine, politics, religion, science, education, psychology, history) and those of the general reader. Contributors are required to avoid needless technicality of language and presentation. Each issue contains an editorial on a topic of philosophical or public interest, and a ‘New Books’ section. The institutional subscription includes two supplements. Recent contributors have included Michael Dummett, Noam Chomsky, Jurgen Habermas, David Wiggins and Mary Warnock.